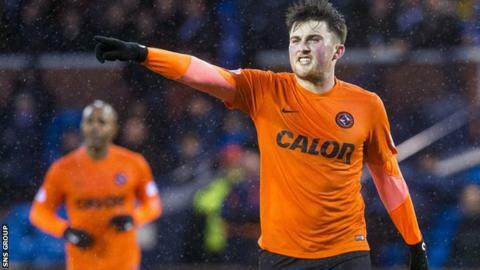 Hearts ended a very busy deadline day with the signing of defender John Souttar from Dundee United for an undisclosed fee. Souttar, 19, has agreed a three-and-a-half-year deal at Tynecastle. "We see him as one of the brightest young prospects in Scotland, and one who we can develop further," head coach Robbie Neilson told the Hearts website. "I'm delighted to have signed for Hearts," said Souttar. "I'm joining a brilliant club at a great time." Souttar made his United debut in January 2013 and played 73 games for the Premiership's bottom side. The Edinburgh club had seen earlier approaches for the player rejected by United, who are 11 points adrift of the play-off place. The Scotland Under-21 cap turned down the offer of a new deal at Tannadice and had entered the final six months of his contract. "John's a player who we've admired for a long time and I'm delighted to secure him," added Neilson. "It shows the intent of Hearts to not only develop young players from our own academy, but recruit them too and continue their development." Souttar said he was joining a club where the head coach likes to give young players the chance to shine. "I'm really looking forward to getting stuck in and getting my career back on track," Souttar added. Hearts have also recruited Don Cowie and Abiola Dauda, while they have agreed to sell top-scorer Osman Sow to a club in China. Meanwhile, Morgaro Gomis has joined Motherwell on loan and fellow midfielder Danny Swanson has left by mutual consent.